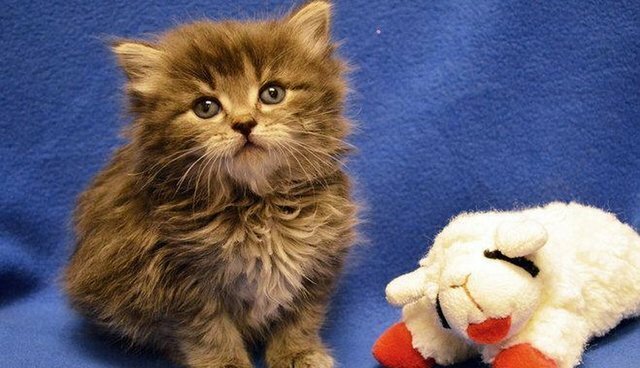 This tiny gal has already been through a lot in her young life: At just 4 weeks old, she was tossed from a moving car at a busy intersection in Milwaukee. Thankfully, a Good Samaritan rescued the little beauty, who was frightened but unharmed. "She ran right to me and I scooped her up," the woman who found her told the Wisconsin Humane Society. The kitten, who now goes by Buffy, weighed less than a pound when she was brought to the Humane Society, the Milwaukee Journal Sentinel reports. 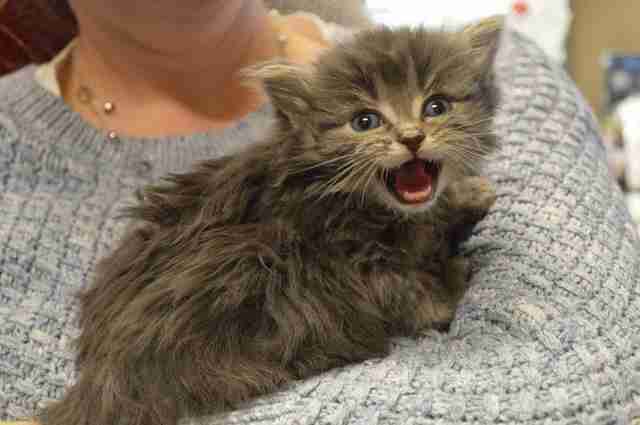 "She's the sweetest little puffball," Angela Speed, a spokeswoman for the Wisconsin Humane Society told The Dodo. "It broke our hearts to hear how she was treated." Speed said that Buffy is in a foster home now, getting the love and care she needs to grow. "Buffy has a hearty appetite," she added. Buffy's foster family keeps her updated on the kitten's status, and they tell her that Buffy is happy, healthy and loves playing with her toys. As soon as Buffy is 8 weeks old and weighs more than 2 pounds, she'll be able to go to her forever family. But the humane society is quick to point out that there are lots of kittens like her who need foster families and forever homes. In an update about Buffy on its Facebook page, the shelter added: "April is a critical foster recruitment month for us, in preparation for kitten season - not to mention the dogs and puppies who will need foster care this spring and summer." To find out what you can do to help out during this kitten season, contact your local humane society. This story has been updated to include a comment from the shelter and additional photos.